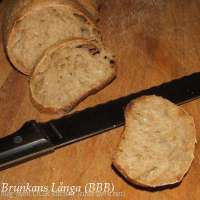 It doesn’t feel like it has been over two years since the BBBabes made Brunkans Långa! And the other day, when fellow BBBabe Ilva suggested revisiting it with anyone else in the Google+ Bread Bakers’ Group, I jumped at the chance. Sure, it looks a bit like a giant caterpillar. But I remembered that it was fabulous. And not very hard to make. But how memory plays tricks on us! Right up until just after mixing the final dough, I was convinced it was going to be rye bread. Why?? I think it might be because of the Graham flour I used last time. It had some rye flour in it. Then, right up until I thought it should be time to turn the oven on, I remembered that had miraculously risen perfectly in the fridge and that it was easy easy easy to plop out of the container. Well. I did remember correctly about how easy it was to make the starter. But I also remembered that there was no overt sourness (unlike my other nightmares with natural starters). This time, I didn’t bother going to the Health Food Store to get actual “Graham Flour” and decided to use the 100% Whole Wheat (no additives) that we have on hand. By Day 2, there were already bubbles. By Day 3, the bubbles were more pronounced and it smelled of yoghurt. By Day 4, it was incredibly bubbly and smelled just a bit funky until I mixed in more flour and water. Whoa!!! Stiff dough! Really stiff. I made one more executive decision (do I get a raise now because of all these executive decisions?) and added 60gm more water. I went ahead and added extra water right from the outset. The resulting dough was the perfect consistency and very easy to knead. I plopped the kneaded dough into the mixing bowl to rest for 30 minutes before putting into the parchment lined plastic box. And then, I happily took the box to sit by the back door where it’s around 10C. I was certain that I WAS going to be baking that night. The next morning, I skipped downstairs to the back door, stopping in the kitchen to turn on the oven, sure that the dough would be just reaching the top of the container. Ha. Again. Not a chance. It hadn’t even budged. My guess is that it might have been even colder than 10C by the back door. Look at what I saw when I arrived! Pretty, isn’t it? So I turned off the oven and stuck the container (after making sure the temperature was below 100F) into the oven. The sun came out but wasn’t nearly warm enough to melt the snow. Aren’t incandescent electric lights in ovens handy? Finally finally, by early afternoon, the dough was reading for its final shaping! At last, I turned on the oven, struggled to get the risen sloppy and slack dough out of the container and labouriously scraped bits of dough off of the parchment paper and plopped the little bits of it down on the heaving mess on the lightly floured board. Then I carefully folded it over and it looked much more reasonable. Pretty much the way I remembered it looking the time I made it before. But let me tell you: it wasn’t easy to get the two loooooong loaves onto the stone! Between the two of us we managed it. For the most part. Here, as you can see, the loaf wrapped itself around the stone. Still, in spite of slight charring on the bottom, the loaves look pretty fabulous. I was only a little disappointed that this isn’t the rye bread that my feeble brain thought it was making. I was very disappointed that the bread was still too hot to taste. It’s DELICIOUS. There is just the barest hint of sourness. This really is the most fabulous bread! I cut one of the long loaves open. It looked beautiful. I love it when the holes are shiny! Why oh why oh why is there always a “but”? AUGGHHHHHHHHHHHH!! Sour!! That characteristic sourdough smell filled the kitchen. Swallowing our disappointment, we tasted it anyway. And you know what? It’s pretty good. No. It’s really good. The sweetness of the demerara sugar and honey balance the sourness from the starter. Once these loaves are finished, I may just have to make it again. There is zero rye flour in the bread. Next time, I will add just a little – perhaps I’ll exchange it for the 200gm whole wheat flour I used in the final dough. I used instant yeast instead of active dry. I can’t WAIT until that jar of instant yeast is finished. I’m not going to make that mistake again! The rising time was WAY longer! Because I can’t easily buy unbleached bread flour any more, I used unbleached all-purpose flour and vital wheat gluten (97% all-purpose flour + 3% vital wheat gluten). I scorched the bottoms of the loaves. Next time, I must put the stone on the top shelf. If you haven’t made this amazingly delicious bread yet, do try it. Please don’t be discouraged by my experiences. I like to exaggerate. Just remember to watch for burning on the bottom. And don’t be discouraged if it takes much longer than you think it will to rise. Now, excuse me while I go and wake T up. I think we neeeeeeeed some Brunkans Långa toast. This entry was posted in baking, BBBabes, bread - yeasted & unyeasted, food & drink, whine on Sunday, 10 February 2013 by ejm.